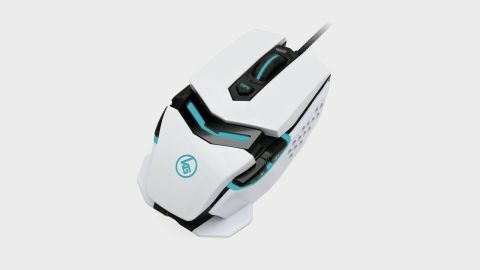 A heavy, ambidextrous gaming mouse with an extremely gamer aesthetic. A heavy, broad gaming mouse that leans into RGB lighting and gaming aesthetics but performs well and is remarkably sturdy. Known primarily for producing cables, adapters, and other PC and A/V connectivity kit, Iogear has begun its entry into the crowded field of gaming peripherals in an attempt to unseat some of the best gaming keyboards and best gaming mice. A subsidiary of Taiwanese parent company ATEN International, Iogear has targeted a very specific interpretation of 'gamer' aesthetic with its accessories, leaning hard into rainbows of RGB lighting and sharp, futuristic angles and materials, and the Fokus 2 is the pinnacle of that trajectory. It begins with a precision cast aluminum frame, which partially explains the weight of the unit. The Fokus 2 is a heavy mouse, weighing in at 130g even without the durable, braided cable, and for many this will likely be a deal breaker. If you prefer a sparrow-weight mouse designed to fly effortlessly across your desk, the considerable bulk of this pointer will be an immediate turn off. But if you don't find a little additional heft offensive, and particularly if you have larger hands, the Fokus 2 is a great fit. Personally, I like a mouse that feels substantial and dense, and the few extra grams won't fatigue your hand during use. The one glaring issue with the mouse's layout is the position of the left thumb buttons, which are perched so far back on the top of the left panel that you have to crook your thumb uncomfortably to reach them, especially the rearmost button. I wouldn't rely on them for time critical functions in twitch shooters, but like all eight of the Fokus 2's buttons they can be customized to perform virtually any function you desire. This is every inch an MMO mouse, rather than a shooter pointer. The additional two side buttons on the right of the mouse, mapped by default to volume control, are a welcome bonus particularly for left-handed gamers who crave thumb controls, though like their counterparts they're also tucked too far back to be easily actuated. The chassis itself is all angles, and paired with the glow of RGB light pulsing through its seams, and from beneath, the hex pattern at the front of each side panel gives the impression of a suit of futuristic power armor (or one of our sentient future robot overlords). It's not quite the peak of metal plate, distended electronics that so many peripheral manufacturers seem to have decided that gamers crave, and I enjoy the recessed channel running through the center of the mouse and extended feet on the base, but for anyone looking for an understated pointer, the Fokus 2 is a non-starter. In a way it's a pleasant change of pace from the middling attempts to please every single consumer. As the saying goes, be either hot or cold or I shall spit you out of my mouth, and Iogear has made some firm, resolute decisions in the Fokus 2's design. The Pixart PMW-3360 optical sensor delivers excellent performance as well, with a CPI up to 12,000 and variable polling rates up to 1,000Hz. The respectable 250 IPS also means you're not likely to lose tracking even whipping the mouse around at top speed. Anecdotally, the mouse feels precise and responsive, both in games and for productivity tasks, and the scroll wheel finds a decent balance between stiffness and freely spinning (though it edges a bit too close to the latter for my tastes). As someone accustomed to a 16,000 CPI sensor I would've preferred a higher ceiling for the Fokus 2, but for most users 12,000 is more than sensitive enough. The Kaliber Gaming software package for the Fokus 2 is simple and intuitive to use, no doubt in large part because it's able to narrowly focus on a single peripheral. Where a number of manufacturers are forced to design software to support a huge range of hardware, the singular focus is a boon here, with a basic, easy to navigate series of menus that nonetheless offer the full breadth of options a gaming mouse demands. It's a breeze to instantly reprogram any of the eight buttons or set up a custom lighting profile, and up to five profiles can be stashed on the mouse itself if you'll be using it in multiple settings or sharing it with others that have different preferences. There's even an option to adjust x and y axis sensitivity independently, or alter the CPI values that the top button toggles through. The Fokus 2 is designed in a way to immediately signal whether or not it's for you. If you want a slender, feather-weight mouse or one with a smooth, rounded, understated design, you can immediately move on. But if a thicker, heavier mouse is an attractive proposition, and if you prefer the glowing robotic plate aesthetic, the Fokus 2 is very easy to recommend. It's not quite best in class in any single category, but everything it does, it does well, and it's competitively priced at $49.95.